Hutchesons sits proudly at the edge of the vibrant Merchant City, a bustling social hub close to the city centre. Spread across three floors of an impressive old towered building adorned with columns and statues, Hutchesons is a favourite place of ours for brunch in the big city. It’s morning menu offers all the great classics you want such as a delicious eggs Benedict or a full Scottish breakfast. Make a morning of it with their Bubbles and Brunch which includes either a bottle of Prosecco or Champagne too. The decadent grandeur of their city grill restaurant is stylish, bustling and vibrant, reflective of the city itself. The Ubiquitous Chip, or ‘The Chip’ as the locals call it, is somewhat of an institution in Glasgow. Located on the hip Ashton Lane this maze of a building features a central leafy courtyard restaurant for bistro-esque food and light bites, a brasserie-style fine dining room upstairs, plus a rooftop bar and casual mezzanine level. Founder Ronnie Clydesdale became famous for his, at the time groundbreaking, focus on local produce and regional dishes. 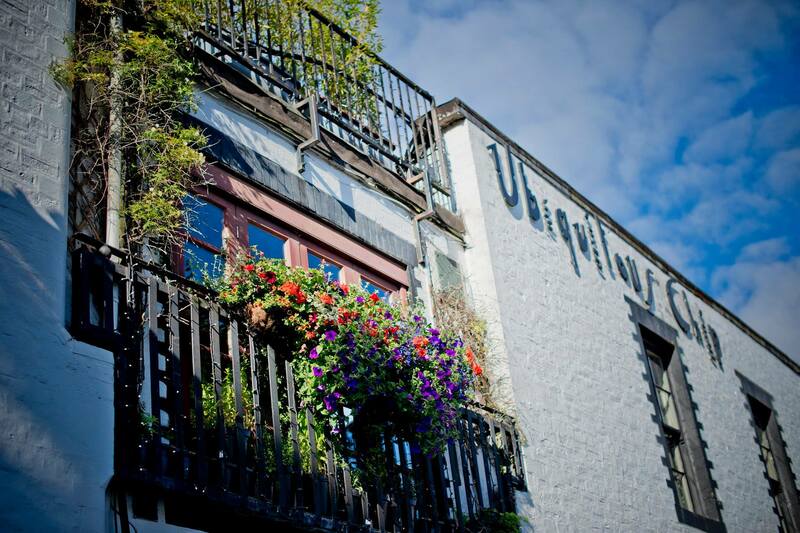 This ethos continues today and the restaurant is as popular with famous faces as with the locals. 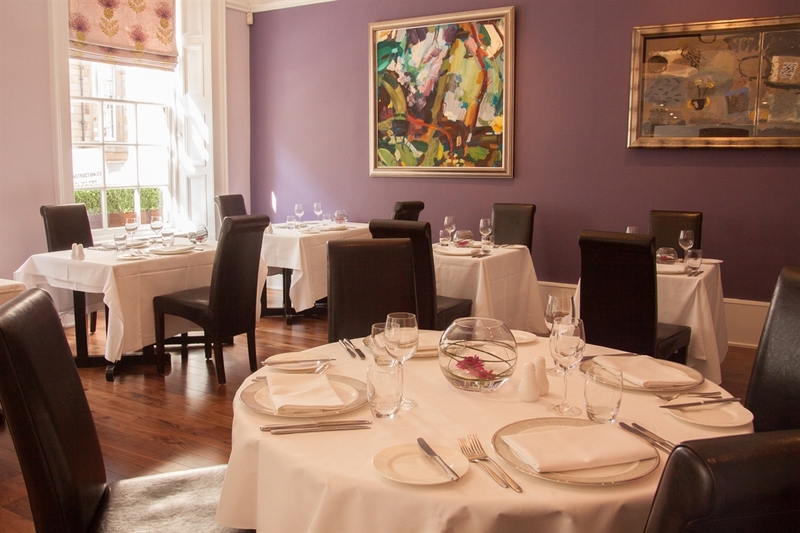 For the ultimate in fine dining at the centre of Glasgow, Brian Maule at Le Chardon d’Or is second to none. Brian himself has has classic french training, something that reflects in his menus. He takes a very hands on approach, ensuring each and every dish is of the high quality he expects before it leaves the kitchen. He is even known to come out and chat and explain the dishes to guests dining in his restaurant. The dining room itself is simple and elegant with no extra frills. The food on offer changes with the seasons but is always mouth-watering and beautifully presented. Whilst Edinburgh may be the national capital, Glasgow is the capital of style. People in this city care about their appearance and so where better than to do a spot of shopping. Princes Square is a beautiful boutique mall right on the ‘style mile’ or Buchanan Street, the main shopping avenue in the city. You will be sure to notice this building thanks to its striking architecture and the giant metal peacock stretching across its frontage. Inside is a whole host of fashion forward brands such as Kurt Geiger, Reiss, some treasure troves for the magpies among us such as Dover & Hall and Links of London, and some beauty big guns such as Space N.K. and Jo Malone. 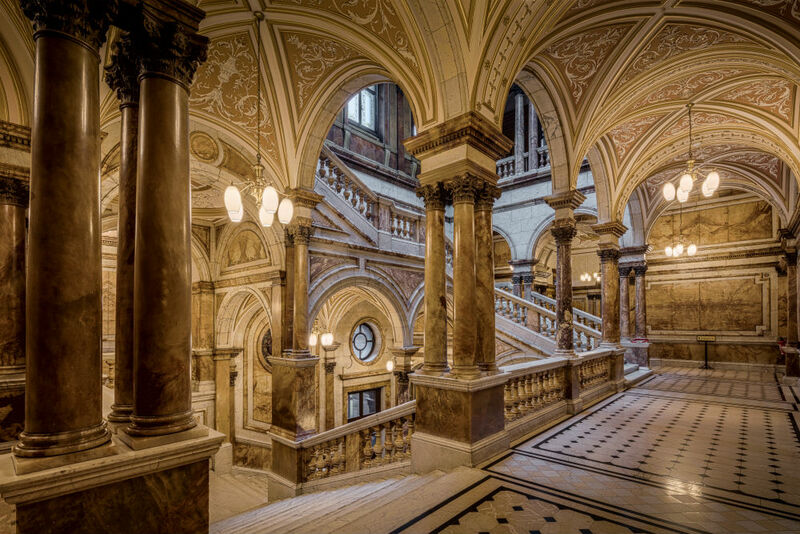 From Princes Square, take a short walk to Ingram Street. This streets is lined by some real architectural gems, from modern towers of glass to incredible old banking halls. This is the most exclusive fashion street in Glasgow where designer, luxury and niche brands gather from Ralph Lauren to Emporio Armani. Get your high-fashion fix here. Glasgow was a European Capital of Culture in the 90s and was awarded UNESCO City of Music status in 2008 for its incredible music scene, so there is no doubting the city’s cultural prowess. Whilst visiting the city it’s an absolute must-do to dip your toes into this amazing cultural scene. Alongside the myriad of museums in the city, we recommend booking yourself into see a show at the Theatre Royal, home to Scotland’s resident companies, the Scottish Opera and the Scottish Ballet. If music is more your thing, the Glasgow Royal Concert Hall stands in a commanding location at the top of Buchanan Street and has seen the likes of BB King, Johnny Cash, Debbie Harry and Van Morrison grace it’s stage. Home to the National Orchestra of Scotland and with over 250 performances a year, it is definitely worth keep an eye on their programme for any visits to the city. Whilst Barcelona as Gaudi, Glasgow has Mackintosh. The renowned architect and designer Charles Rennie Mackintosh has had a lasting effect on Scottish and in particular Glasgwegian culture and Glasgow is the best place to experience his work in context and learn more about the amazing creative. With over 40 years of organising tours, the Charles Rennie Mackintosh Society know a thing or two. They offer a two day tour package which includes accommodation at the Carlton George Hotel, a VIP drinks reception and a guest lecture by local artist Avril Paton. We suggest contacting the experts to organise a bespoke private tour for you and your party whilst in the city – the society can allow exclusive access into some amazing Mackintosh buildings. 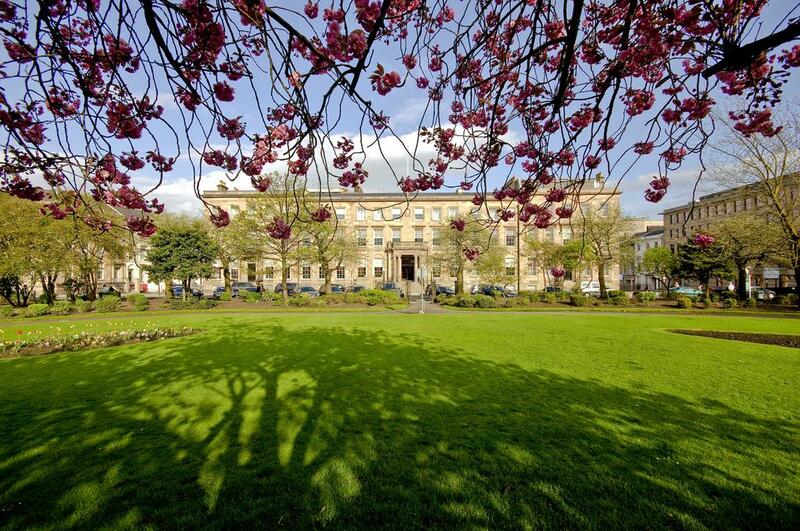 The Blythswood boasts an ideal city centre location overlooking a quiet private garden square. Formed from a terrace of Georgian Townhouses which used to be home to the rich merchants of Glasgow, the hotel has recently undergone a significant refurbishment. It is the only 5-star hotel in the city and is highly acclaimed for its top service. Rooms are a luxe mixture of textures and subdued tones – expect pops of lilac against contemporary marble fixtures and brown leather headboards against dark grey walls. This combo continues into The Salon and the restaurant which feature beautiful original Georgian features combined with modern sophisticated furnishings. We would highly recommend their afternoon tea! 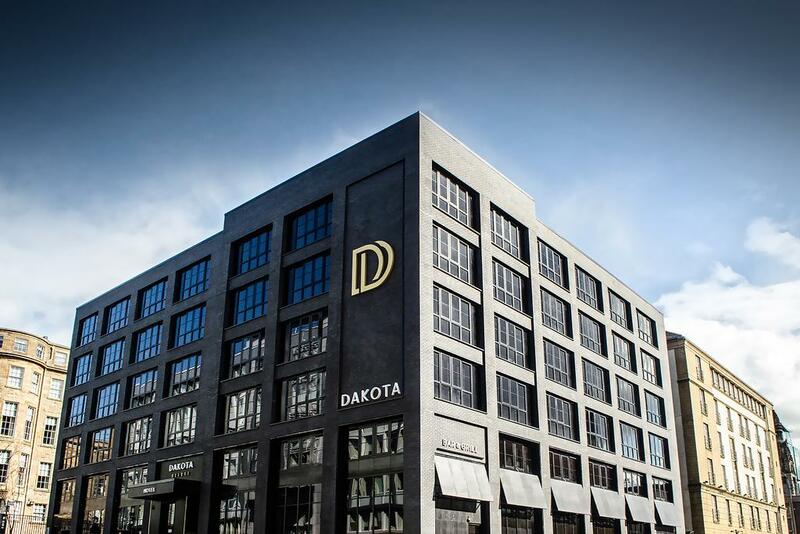 The dark grey façade and black glass warehouse-style windows might be more reminiscent of a building in Brooklyn than a luxury hotel in Glasgow. The distinctiveness continues inside where a dark neutral colour palette runs throughout with lots of leather set against charcoal grey. The whole hotel has a cosy slightly masculine feeling to it and with 83 sleek rooms, it also feels suitably boutique-ey. Located just off Blythswood Square, its situation is ideally centrally. For refreshment, hit Jack’s Bar, the perfect place for aperitifs whilst the candlelit basement restaurant offers something a bit more intimate. Located on a tree-lined terrace in the stylish west end of the city, Hotel du Vin Glasgow offers a little more seclusion away from the city centre whilst still being at the centre of the action in the buzzing west end as well as attractions including Kelvingrove museum and the Glasgow Botanical Gardens. The hotel has 49 bedrooms and suite, many of which retain the original Victorian features of the building. Décor is stylish but on the opulent side with many rich textures and textiles throughout rooms. The hotel also boasts a 3 AA Rosette bistro housed in an elegant if slightly lavish dining room with a focus on organic produce. 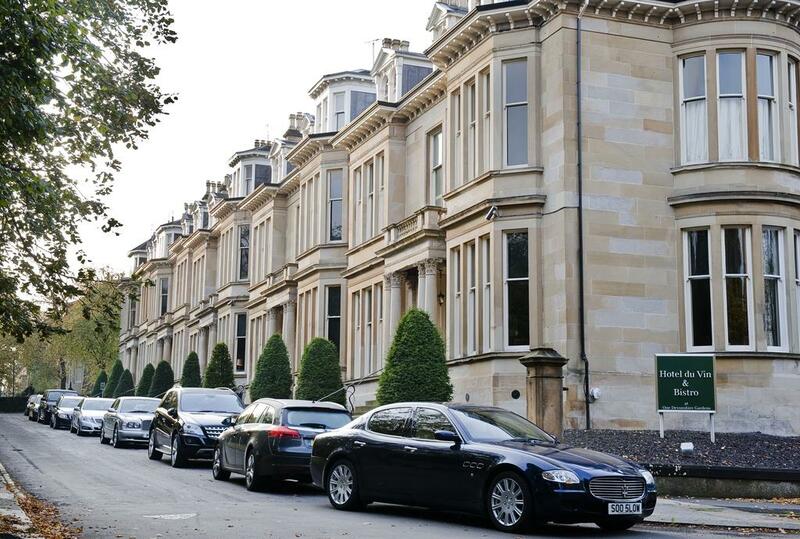 For more luxury hotels in Glasgow, read our luxury hotel guide.